Entergy customer service manager Stan Foley (third from right) presented an $18,000 grant on Friday morning to (from left) FCS chair Janis White, COE dean Genevieve Brown, provost and vice president for Academic Affairs David Payne, CHSS dean John De Castro and education associate professor Carol Parker, for three projects benefiting the Huntsville community. An $18,000 grant from the Entergy Charitable Foundation will allow three departments to share their knowledge with the Huntsville community. The grant was presented to provost and vice president for Academic Affairs David Payne by Entergy Huntsville customer service manager Stan Foley on Friday (Dec. 14) morning. “Sam Houston State University deeply appreciates the generosity of Entergy in supporting our efforts to serve students and enhancing the university community relations,” Payne said. The three-fold grant will be disbursed to the family and consumer sciences and mass communications departments and the College of Education. FCS will develop a brochure on energy-efficiency for low-income customers and mass communications will work with Walker County Emergency Management in radio notification systems for such events as Hurricane Rita, Foley said. The College of Education will work with the Boys and Girls Club in mentoring and “closing the achievement gap” for junior high students at Mance Park Middle School to help with the transition from high school to higher education, according to Carol Parker, associate professor in the educational leadership and counseling department. 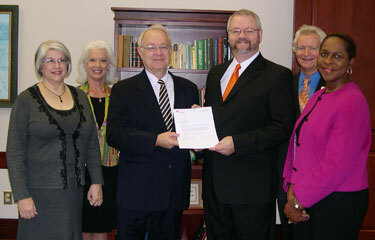 In addition to the SHSU grant, Entergy also funded two other Huntsville-area entities: the Community Organization for Missionary Endeavor (COME) Center received $3,000 for school supplies for students in kindergarten through fourth grades and the Walker County United Way received $4,000 for youth scholarships. The EFC accepts applications three times per year, and the application deadlne for the first 2008 cycle is Feb. 1. Departments interested in an ECF grant can contact Delia Gallinaro, assistant director of Research and Special Programs, who helped coordinate the “bundled” proposals, at 936.294.3760. Hull-Daisetta High School principal Quinn Godwin and technology coordinator Joyce Tulley (center) accept 15 refurbished computers, two printers and two scanners on Friday from computer science department chair Peter Cooper (left) and visiting assistant professor Li-Jen Shannon and Property coordinator Wayne Frosch (right). The Sam Houston State University computer science department gave the gift of learning this Christmas to Hull-Daisetta High School on Friday morning when it donated 15 refurbished computers to the school. 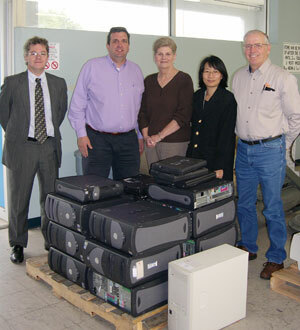 The systems were refurbished by members from the Sam Houston Association of Computer Scientists, using equipment donated by computer science faculty and staff members, as well as equipment discarded by Computer Services, according to computer science visiting assistant professor Li-Jen Shannon. The class A school also received two color printers and scanners as part of the donation. The annual program is part of the student organization’s community outreach project for schools that have a need for the computers. Hull-Daisetta High School, located near Liberty, will use the equipment to open a TAKS lab for its students. "Our campus was rated unacceptable this year, so this is something that we definitely need,” said HDHS principal Quinn Godwin, who added that the school has received a grant that will allow them to purchase software. Over the past four years, the computer science department and SHACS have also donated computers to the Livingston, Shepherd and Big Sandy school districts. HDHS was one of four schools that contacted the department this year requesting the donations. Because the school needed 20 systems and SHSU was only able to complete 15, SHACS and the computer science department will donate the other five after they are completed next semester, Shannon said. Texas A&M has recruited foreign languages professor Enrique Mallen’s online Picasso Project to help with research for one of its National Science Foundation grants. TAMU’s Center for the Study of Digital Libraries will study the online database, which chronicles nearly 14,000 of Pablo Picasso’s art and literary works. Mallen started the project while teaching at TAMU in 1997 and moved it to SHSU when he came here this fall. “The purpose of the grant is to investigate how users of the Picasso Project will be utilizing Picasso manuscript documents which are simultaneously encoded for text and graphic composition,” he said. The “relatively small NSF grant” has a budget limit of $450,000 over three years, but “it constitutes one more significant step in the collaboration between the humanities and computer science,” Mallen said. The grant proposal aims to support analysis and understanding of documents whose meaning depends on both the textual content and the visual representation of that content. The grant proposal will also involve the participation of SHSU students in Mallen’s classes as the project unfolds, “as they use the relevant documents themselves,” he said. Two senior ROTC cadets joined the ranks of the second lieutenants in the U.S. Army on Friday afternoon during the SHSU military science department’s winter commissioning ceremony. Taking the Army Oath of Office were Charles Robert Pipes and Idris Teniola Taiwo. Pipes, a Garland native, will also receive his Bachelor of Arts degree in history, with a minor in military science, during Friday’s commencement ceremony. While in ROTC, Pipes was a member of both the color guard and the Schuder’s Rangers Company for three years, holding leadership positions in both. He received a commission as a field artillery officer in the Texas Army National Guard and will serve his first duty assignment with the 1st Battalion, 133rd Field Artillery Regiment, 36th Infantry Division in Nacogdoches. Taiwo, a Houston native, will receive his Bachelor of Science degree in criminal justice, with a minor in military science, during Saturday’s commencement ceremonies. A two-year Army scholarship recipient, he was a member of both the ROTC Schuder’s Ranger Company and color guard, as well as vice president and president of his residence hall, and played intramural sports for all four years of college. Taiwo will begin his Army career in Korea on active duty in the infantry branch detail of the Signal Corps. The Harlem Globetrotters, one of the most popular and recognized basketball acts in the world, will make their first SHSU appearance in three years on Feb. 4 in the Johnson Coliseum. “Magic as Ever” 2008 world tour tickets will go on sale on Wednesday (Dec. 12) and can be purchased through the Recreational Sports Department, in Health and Kinesiology Center Suite 162, during normal business hours or online at http://www.ticketweb.com. The Feb. 4 performance will be held at 7 p.m.